WAXHAW, N.C. – Perhaps no college quarterback will enter the 2019 season surrounded by more intrigue than Austin Kendall, for he is the nation’s ultimate mystery man. It’s plausible that Kendall might have been one of the nation’s best quarterbacks the past two seasons. There just wasn’t any way of proving it. Kendall had the strange fortune of being behind back-to-back Heisman Trophy winners at Oklahoma. When Kendall takes the field this fall, he will finally be able to answer the question of whether he’s the next Heisman-caliber talent to roll off Lincoln Riley’s assembly line, albeit with a different coach at a different school. Based on Johnson’s experience, it won’t take long to find out. The coach says he knew Kendall was a Division I quarterback the first time he saw him throw. Austin Kendall set multiple passing records at Cuthbertson High in Waxhaw, N.C.
Kendall’s road to West Virginia began on a lacrosse field – albeit not one on which he was playing. Heading into his freshman year of high school, Kendall was supposed to be the backup quarterback behind older brother Ryan. But when a broken hand sidelined Ryan during a spring lacrosse tournament, Austin picked up all of the summer passing reps. Though Ryan was healthy enough to play by the start of football season, Austin replaced him as Cuthbertson High’s starter by the fourth game. Following his breakout freshman season, Austin Kendall underwent his first football change of scenery. Cuthbertson went through a coaching change, and hiring procedures left the spot vacant from the end of the season until July. With Division I programs already showing interest, Brian Kendall didn’t want to risk seeing his son’s recruitment torpedoed if the school brought in a run-oriented coach. 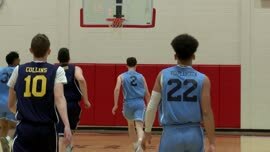 Austin spent his sophomore year at Charlotte Christian – a move that Brian wishes he hadn’t made in retrospect since Ryan was still at Cuthbertson. 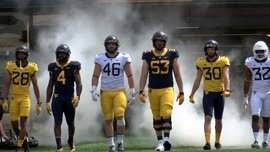 Even though he didn’t end up getting a football scholarship, Ryan played another key role in the path that eventually brought Austin to Morgantown. Deciding to forego a lacrosse scholarship to Mercer, Ryan took his chance as a walk-on receiver at Kentucky after being sufficiently impressed by then-Wildcats offensive coordinator Neal Brown. 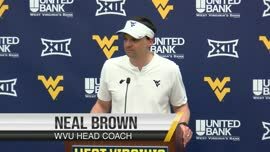 Well before taking over at West Virginia, Neal Brown tried to recruit Austin Kendall to Kentucky. The Kendalls weren’t naïve. They knew Kentucky was attempting to offer Austin something no other school could – a chance to play with his big brother in two years. But Brown’s character and charisma also won them over. They just didn’t realize Brown was anyone important the first time they met the youthful coach on Austin’s unofficial visit to Kentucky. Upon enrolling at Kentucky, Ryan never felt he was being treated as a walk-on or a pawn to land his younger brother. Brown always gave it to him straight. Had Brown stayed at Kentucky, it’s likely that Austin’s college path begins and ends in Lexington. Austin Kendall shined on the field after originally committing to Tennessee, though his path soon took a few more turns. Instead, Brown became Troy’s head coach while Austin Kendall kept his options open after transferring back to Cuthbertson High. Before the start of his junior season, Kendall committed to Tennessee with the intent of focusing on Cuthbertson’s schedule rather than his recruitment. The approach was effective. Kendall completed 310-of-513 passes for 4,461 yards and 49 touchdowns and his team reached the state semifinals after an 0-3 start. “The No. 1 attribute is his football IQ,” Johnson said. “On top of that is his accuracy. He’s really good at leverage. He can make all the throws. Opposite hash sideline, opposite hash fade. On the run to the right, on the run to the left. Johnson gave Kendall the autonomy to change plays on his own – flexibility he has never afforded another quarterback. “You don’t even have to ask that,” Johnson said with a chuckle. The most memorable game came in a win against archrival and eventual state runner-up Weddington, which Cuthbertson had never beaten. Though Weddington scored to take a late lead, its coaching staff was alarmed that Kendall had more than a minute left to drive 75 yards. “We scored and gave him too much time,” said Weddington coach Andy Capone, who was the team’s offensive coordinator at the time. “He was just masterful. There’s no bad situations for that type of talent. 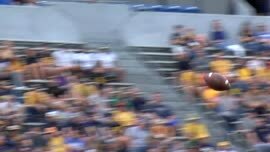 We didn’t want to see him get the ball back. Kendall showed what made him college caliber on that drive. It wasn’t just the throws. Kendall had to make all his decisions at the line because the clock was ticking. And the final two plays were with his feet on designed runs – a long one to get the ball to the 1, followed by the game-winning touchdown with 18 seconds left. As swimmingly as things were going on the field, his recruitment was about to hit a rocky patch on his road to Rocky Top. That January, the Tampa Bay Buccaneers hired Volunteers offensive coordinator Mike Bajakian, who had been Austin’s primary recruiter. Brian Kendall said the family heard nothing from the Vols coaching staff for a week after Bajakian’s departure, raising a red flag. From there, it became apparent that Tennessee coach Butch Jones was more enamored with New Jersey prospect Jarett Guarantano, leading Kendall to re-open his recruitment. Though Kentucky remained in the mix, Oklahoma’s tradition and explosive offensive scheme eventually rose to the top. Austin Kendall stands next to a barely recognizable Will Grier following a Charlotte-area passing camp while both were in high school. The details of Kendall’s departure from Oklahoma are well-known. While he never planned to leave the program, he made sure to earn his degree in enough time to transfer in case the situation presented itself. He bided his time backing up Baker Mayfield and Kyler Murray with an eye on starting in 2019, though he did give Murray a run for his money last August. The January arrival of Alabama graduate transfer Jalen Hurts forced Kendall’s hand. 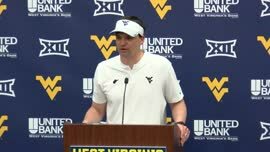 Now that he’s at West Virginia, Kendall is poised to be the Mountaineers second straight starting quarterback from the Charlotte area. Just as he would have done at Oklahoma, Kendall is stepping into big shoes. Will Grier had a historic season for the Mountaineers, finishing fourth in the Heisman race. Though Kendall and Grier they never faced one another head-to-head, coaches who have seen both quarterbacks play think Kendall can raise his game to a similar level. Capone agrees that both are among the best to come out of the Charlotte area.